By this feature you can get the probable half time or full time corner result based on the soccer corner statistics database. If at a live match you know the 37. minutes corner result you can get the probable half time corner result. 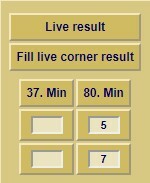 If at a live match you know the 80. minutes corner result you can get the probable full time corner result. This function is not a live result feature. This is a predict function at a live match. So you have to fill out the exact live corner result into the 37 or 80 minutes text box. and final after you choose the teams click the red-white ball. IMPORTANT!!! Please pay attention to being the home team in the first and the away team in the second places. Among other things the software takes into consider the results of a team home and away games.